This artist was persecuted by the national-socialists as a "degenerate" painter, and was banned from painting. 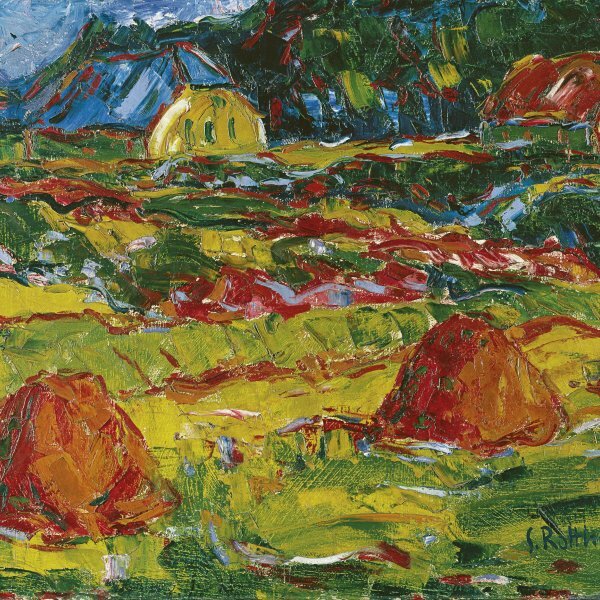 This and the financial difficulties of the first years after the Second World War made it almost impossible for Schmidt-Rottluff to paint between 1938 and 1947. Until 1945, only during his trips away from Berlin, did he dare to produce, in secret, as well as a handful of paintings, a series of watercolours and drawings, his "never painted works". Only after he was employed by the Berlin Art School, and was able to have his own studio again, did new paintings come to light. 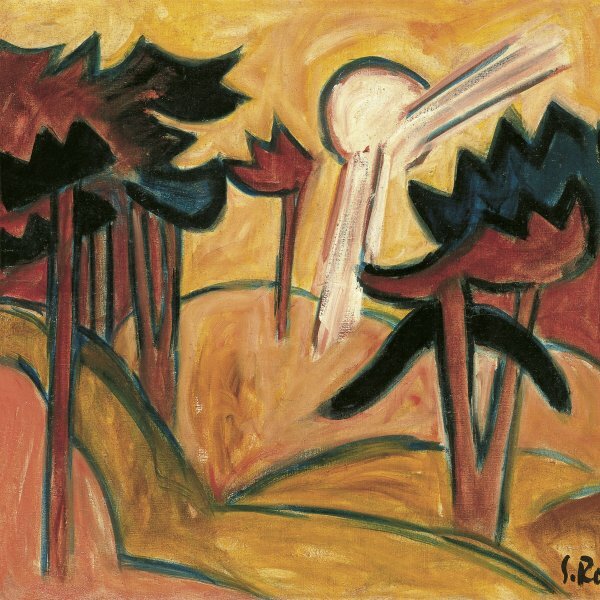 In those made during and after the Berlin blockade of 1948/1949, the isolation of the city is perceivable: around it, there were very few places where Schmidt-Rottluff could freely go which he found inspiring. His compositions of those years also reveal these limited conditions, for example in a still life with the first leaks which arrived by plane to the closed city during the 1948 blockade. Schmidt-Rottluff bore this oppressive situation as stoically as all the other citizens of west Berlin; he did manage to go away on a long trip every year from 1950 onwards, first to Hofheim in Taunus, and then, from 1954, to the small fishing village of Sierksdorf, with the wide beach on the Baltic sea, belonging to the western zone. There, he produced mostly watercolours, drawings and sculpted stones; but the paintings were mainly executed in Berlin. As evidence of the extent to which vital space was reduced there, in the still lifes appears again and again the semi-circular top of the same small table, which can also be appreciated in the composition with seashells. It is dated 1954, the last year in which the artist, who was then seventy, was involved in teaching. 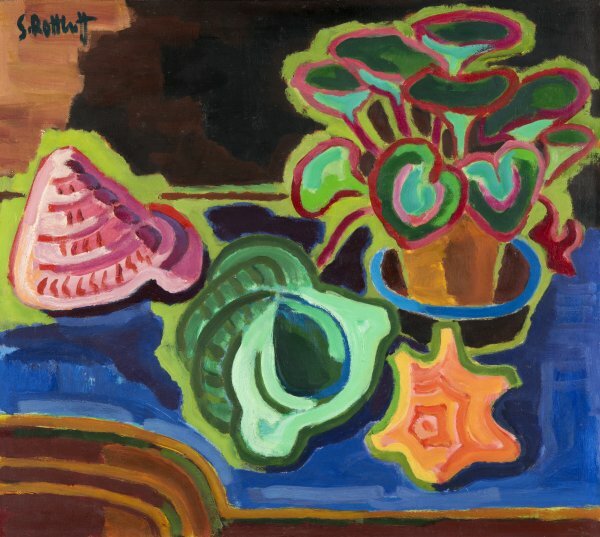 As happened with the Berlin landscapes, Schmidt-Rottluff only had a limited repertoire for the still lifes painted there: pots with plants, books, candelabra, his own palette, receptacles with painting utensils, seashells and conches he had gathered and kept for a long time. Already in various watercolours painted in secrecy in 1943 he had represented seashells and conches: in the Carmen Thyssen-Bornemisza painting they acquire an iconographic meaning. Their brilliant triad of pink, copper green and orange dominates the flowers and leaves in the pot: they are set off by the midnight blue of the background, the green contours and the contrasts of complementary colours. The reduction of shapes, the outlines and the contrasts, used in an elementary way, determine the artist's lapidary style in his vigorous later works. Shortly after its execution, this painting ended up, probably as a present, in the hands of the sculptor Richard Scheibe who, not being persecuted between 1933 and 1945, had helped several times during those years the insulted former members of the Die Brücke group, among whom was also Erich Heckel. When, after the war, Scheibe taught with Schmidt-Rottluff at the Berlin Art School, he represented him in a bronze portrait and in a small bronze plate. This still life recalls that friendship between artists. It makes us forget the difficult conditions in which it was created and shows a value which has always been one of the most important in this genre: the ephemeral character of existence, here represented by a pot with a plant kept alive almost artificially, and by the "dead" nature of the extinct conches and sea animals.